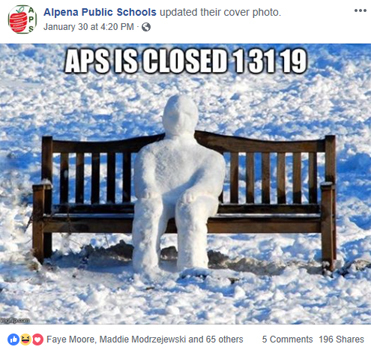 Courtesy image This screen grab shows some recent social media posts that Alpena Public Schools and Alcona Community Schools shared to say that there was no school last week and to announce when the students finally were able to go back to school this week. 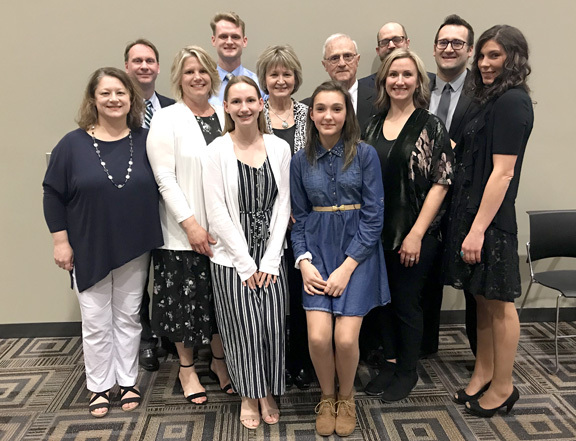 ALPENA — Social media is something everyone uses to connect with others, and school districts are no different — officials use social media to connect with parents, students, and members of the community. Northeast Michigan school districts primarily use Facebook to connect with the community, but Twitter, Instagram, and YouTube are slowly being used more. Alcona Community Schools Superintendent Dan O’Connor said the district’s Facebook page was created about six years ago to communicate with stakeholders and promote the good things that are going on in the district. Lee Fitzpatrick, parent involvement coordinator for Alpena Public Schools, runs the district’s Facebook page, and said the number-one priority is getting the word out. Creative cover photos have been used on Facebook lately to make snow-day closures interesting and give people more of an opportunity to share the post. “It’s just a way to build interest and a picture with an announcement is a very easy, clear message for people to share out,” Fitzpatrick said. Fitzpatrick said the recent snow day posts have been popular. The district last week used images of a guy covered in snow, a train going through a polar vortex, and Elsa from the Disney movie “Frozen” to get the word out that school is closed. Both Fitzpatrick and Alpena High School Principal Thomas Berriman run the high school Facebook page, and Berriman said Facebook is a main instrument in getting the word out to people. O’Connor said research has shown that most people use handheld devices to access the internet, so, it’s a huge step toward reaching more people to use more social media sites to communicate what’s going on in the district. He said the Alcona community has been really responsive to the district’s Facebook in a positive way. 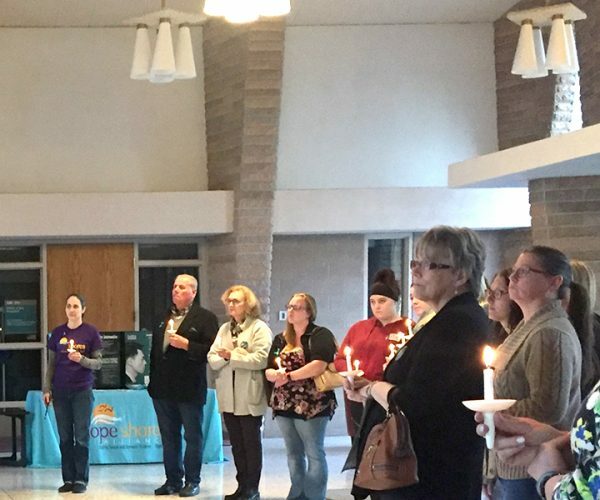 “We’re in the mid-2,000s for likes and, in a county that has only 10,000 people, we feel like we’re doing pretty good on that front trying to connect with not only our parents that live there, but alumni that are gone, and trying to continue to celebrate the good things that are going on with the school,” O’Connor said. The district has a lot of fun with the medium, too. When Alcona Elementary brought in Cona, a therapy dog, the district launched Twitter and Facebook accounts just for him. Fitzpatrick said social media is great when visuals or information can be provided about what’s going on in the district. School districts want the community to know what their students and staff are doing at school. Social media gives people a quick way to ask questions and to gather information, Berriman said. People can also voice their opinions. O’Connor said Facebook is the parent and staff crowd, while Twitter is the student crowd. Alcona Elementary School Principal Tim Lee and O’Connor run the district’s Twitter page, but it hasn’t been used as frequently as Facebook. Alcona needs to have capacity to run social media pages, like Facebook, Twitter, Instagram, and YouTube, O’Connor said. Someone can keep an eye on all the pages, make sure the right grammar is being used, and monitor the comments that are being posted. “It’s a bit of a challenge for us to do that in a small district and that’s why we kind of take a team effort at it,” O’Connor said. O’Connor said they remind people that the district’s Facebook page is an educational page, so if they have concerns or complaints, they should contact the district directly. “We owe our Facebook crowds credit because we have had very few incidents where we’ve had any issues with comments or having to block anybody or anything like that,” he said. Fitzpatrick said Alpena has its profanity filter on the highest level possible on Facebook to keep people from using profanity. He said Facebook is not a place for inappropriate language, personal attacks, or allegations against people. It’s an informational place and for community use. Berriman said students are more likely to use Twitter than Facebook, so if school is canceled, he will tweet that there’s no school to get the word out to students.